Enable immediate development of MV camera with the leading-edge CMOS image sensors and Vision interfaces. A secure environment for users to start developing OpenCL-based acceleration projects at no charge by logging in remotely to a server with Altera high-end FPGA-based hardware and the necessary development software installed. High-speed serial interface achieved using a lightweight protocol. Intel® Arria® V GX broadcasting application development board. Compatible with Mitsubishi Electric CP220. 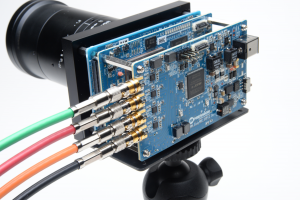 Versatile Machine Vision Camera Development Kit. Can evaluate key technologies making up machine vision cameras, and make it easy to develop prototypes of machine vision camera. Enables quick development of applications conforming to the EMVA GenICam standard. High-speed image data transfer complying with GigE Vision standard. Monitoring kit developed for measuring electrical power. Intel® Cyclone® V SoC Starter Kit. LCD touch bundle for Helio Board. Time synchronization complying with IEEE1588 standard. HSMC daughter card for evaluation of IEEE1588 precision time protocol. Embedded SDK to realize OPC UA Server function recommended protocol by Industrie 4.0 as in “Reference Architectural Model Industrie 4.0”. Multi-task real-time OS for small embedded devices. Next generation Sony CMOS image sensor interface. USB 3.0 I/F HSMC card. High-speed image data transfer complying with USB3 Vision standard. High-speed serial interface compliant with V-by-One HS standard.